Dr. Lawrence Green is an award-winning and internationally recognized dermatologist committed to staying at the forefront of his field, contributing to the latest advancements in dermatology, and being a patient advocate. As a result, Dr. Green is an active member of many dermatological societies and often gives talks and lectures about the latest advancements in the field. Below are some of his most recent talks and lectures. If you’re interested in learning anything more about what you see here or learning about how Dr. Green, the greater Washington DC area’s leading dermatologist, can help you and become your advocate, give our office a call today at (301) 610-0663. Every first Monday of the month! Tune in on the first Monday of every month to the Aesthetic Water Cooler with Dr. Larry Green. Reserve your seat today! “Creating Your own unique Path as a Dermatologist and Being Successful in a Leadership Role.” November 6th, 2018. 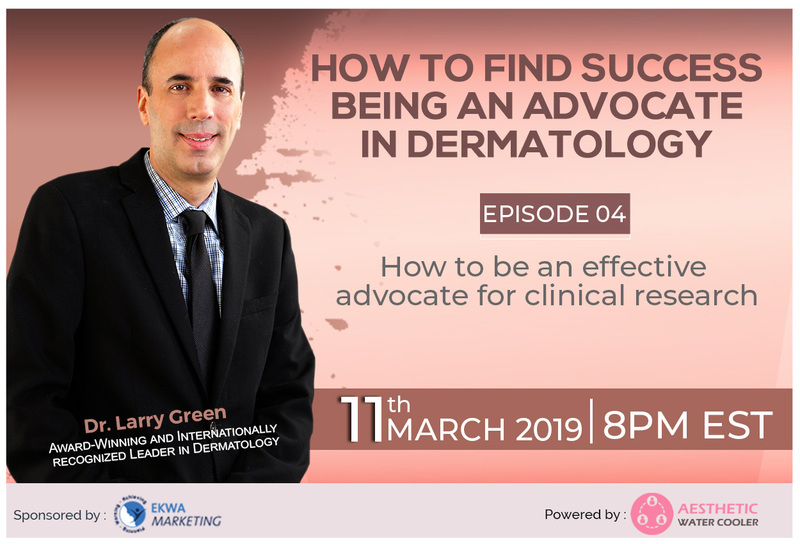 “How to Find Success Being a Dermatologist.” March 11th, 2019. To listen to past podcasts, visit the Growing Dermatologist website! “Innovations in Dermatology: Laboratory Monitoring with Isotretinoin.” December 4th, 2018. DermWrieTV:Bryhali, Xepi Launches; Epionce’s New Facility – November 15th, 2018. “Innovations in Dermatology: Antibiotic Stewardship in Acne Treatment.” October 25th, 2018. “Growth Factor Serum – The Next Generation in Anti-Aging Skincare” – October 12, 2018. “Finding Your Niche Outside of Your Practice” – The Growing Dermatologist, December 3rd, 2018. Dr. Green was featured in an article titled “10 Best Anti-Redness Products to Soothe Irritated Skin” from Prevention.com. February 2019. “Topical glycopyrronium tosylate for the treatment of primary auxillary hyperhidrosis: Results from the ATMOS-1 and ATMOS-2 phase 3 randomzed control trials.” January 2019. Dr. Green was a guest on the podcast The Growing Dermatologist. Check out Dr. Green’s article “Update on Oral Molecules” from The Dermatologist. Dr. Green just did a media interview on Qbrexza on a new topical pad to treat underarm sweating! You can see the interview here. GQ Magazine recently published an article featuring Dr. Green wherein he discussed how to get rid of adult acne. You can view the whole article here. 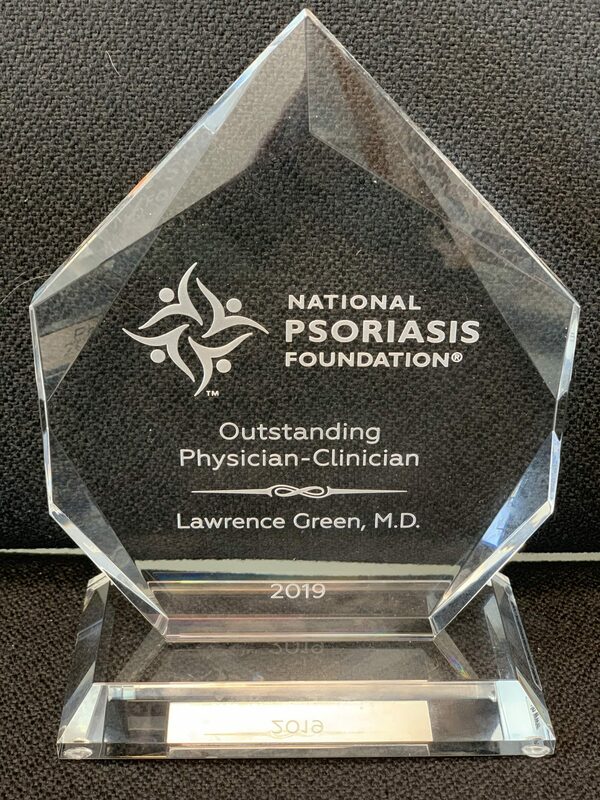 Dr. Green won The National Psoriasis Foundation’s 2019 Outstanding Physician-Clinician of the Year! Dr. Green was recently recognized by Merz as one of their selected National Injection Experts! Dr. Green has been selected Volunteer Teacher of the Year by the George Washington University Department of Dermatology! Dr. Green frequently participates in conferences and meetings to further the field of dermatology. In the past year, he has given the following talks, lectures, and presentations. Winter Clinical Dermatology Conference, Hawaii – January 18-23, 2019. Presentation: Lecture about new treatment for underarm sweating, Qbrexza. Panel discussion between Rheumatologists and Dermatologists about the ways in which we can work together to help our patients – January, 14, 2019. Speaker as a part of the National Broadcast for Qbrexza, a new treatment for underarm sweating. Article in Journal of Drugs in Dermatology. “Once-Daily Oral Sarecycline 1.5 mg/kg/day Is Effective For Moderate to Severe Acne Vulgaris: Results from Two Identically Designed, Phase 3, Randomized, Double-Blind Clinical Trials.” September 2018. Lecture about Hyperhidrosis treatment at the 2019 AAD Annual Meeting in Paris, March 2019.